Austin After the Crash: Where are We Today? It wasn’t exactly a local, well-guarded secret, but it seems like it took a severe nationwide recession to get people to notice the fact: Austin is a great place to be (and one of the best places to invest in campus-area real estate). Regardless, people are catching on. 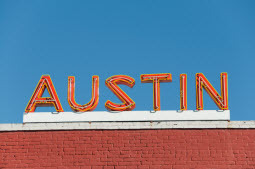 Newsweek recently named Austin as its top city poised for recovery from the recession. Forbes Magazine confirmed it. And the Brookings Institution. And… ok you get the picture. More than 50,000 students attend the University of Texas at Austin (not including faculty, support staff, and those employed by nearby businesses serving the university community). Not only does this provide a dependable population mass living around campus, but it provides a dynamic population as well—the constant change of the local community creates multiple new University of Texas real estate opportunities each year. Similarly, a steady presence of government-related jobs (Austin is, of course, the Texas state capital—and the capitol building is less than a mile from campus) also stabilizes the local housing situation. With 58 such businesses calling the Lone Star State home, Texas boasts more Fortune 500 companies than any other state. The business-friendly climate has helped the state become the nation’s no. 1 destination for job-seekers. In Austin, a strong creative and entrepreneurial vibe has sparked one of the strongest tech-economies in the nation. Altogether, Texas is welcoming more than 1,000 new residents each week. Despite these strong foundations, unemployment in Austin is still hovering around seven percent. There are still approximately 10,000 fewer jobs in the city than there were pre-recession. Still, 17,000 new jobs have been added in the past year (a 2.2 percent annual growth rate). Its unemployment rate is better than both Houston and Dallas. Currently, Austin rental occupancy rates are hovering around 93 percent, and are expected to rise thanks to significant numbers of new-arrivals (who are likely to rent for a while before deciding to buy). In other words, Austin took a hit like everyone else when the economy tanked back in 2008. But thanks to strong fundamentals and a permanent university and government presence, the city was quickly in position to start seeing housing market growth again—and that’s where we see ourselves today. Home prices are still much lower than they were pre-crash, but they’re rising, and most indicators predict further significant growth. And around the UT campus, housing demand will always remain high and renter-friendly. University of Texas real estate is a solid bet. In other words, the market is ripe if you’re ready to buy. Contact one of our University of Texas real estate experts for more information. Posted in University of Texas | Comments Off on Austin After the Crash: Where are We Today? You are currently browsing the College Real Estate Blog blog archives for January, 2011.